The Bourgeois Large Soundhole D incorporates many of the features that bluegrass flatpickers search for in those "Holy Grail" pre-war dreadnoughts. The enlarged soundhole, special rosette, custom pickguard and blank, bound 21-fret fingerboard capture the proper authentic aura for this specialty model. 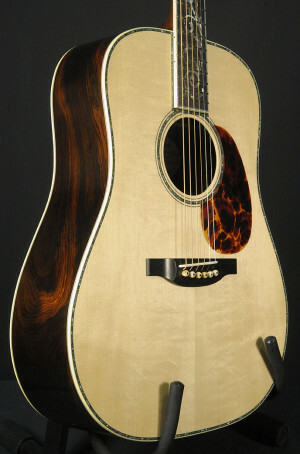 The result is a more of a tribute than a replica, and Bourgeois feels that it makes the perfect bluegrass guitar. Many have remarked that these Large Soundhole Ds are louder and slightly more open than their standard dreadnoughts, while still maintaining their signature balance and clarity. These models have a strikingly "vintage" sound that is sure to thrill many a flatpicker dreaming of owning their own pre-war "bone".